Samsung is expected to introduce a successor to its Galaxy S5 in the first half of 2015, and we learned not long ago that this should be called Galaxy S6 (that’s not exactly surprising, is it?). 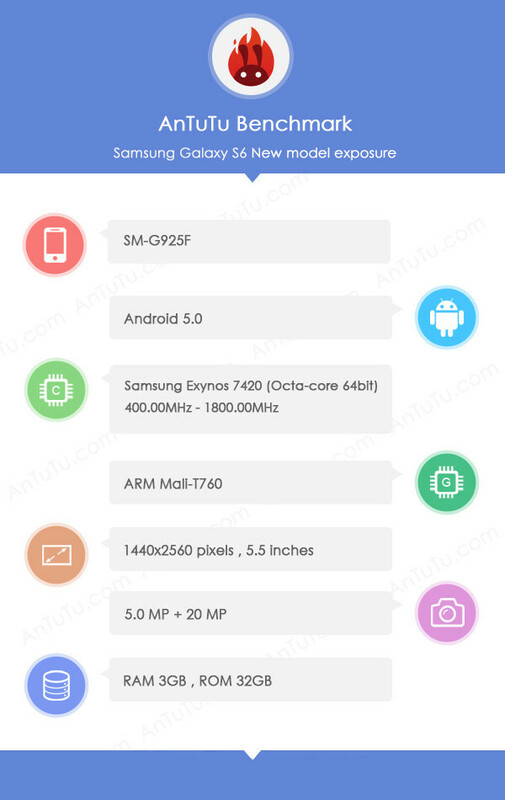 While we’re still many months away from the official announcement of the upcoming handset, the Galaxy S6 may have already showed up on AnTuTu - a website that provides one of the most popular benchmarking apps available on Android. Chinese website CNMO today posted a screenshot which reveals the presence of a Samsung Galaxy S6 SM-G925F in AnTuTu’s database. According to a previously leaked list of model numbers, the SM-G925F is the European version of the new Galaxy (which shouldn't differ too much from other versions). the screenshot - seen on the right - provides accurate information, the Galaxy S6 will come with a 5.5-inch Quad HD (1440 x 2560) display, a 20 MP rear camera, and a 5 MP front-facing camera. Its processor should be a 64-bit, octa-core Exynos 7420 with an ARM Mali-T760 GPU. Android 5.0 Lollipop, 3 GB of RAM, and 32 GB of internal memory are also mentioned. That’s pretty much in line with what was previously rumored. Design-wise, the Galaxy S6 should take a whole new direction - part of a project internally codenamed Project Zero. The upcoming flagship might borrow some design elements from Samsung’s recent metal-made handsets, including the Galaxy Alpha, Galaxy A5, and Galaxy Note 4 (though this one is only partially made out of metal). Besides a regular Galaxy S6, we might also see a Galaxy S6 Edge, which supposedly sports a curved display a la Galaxy Note Edge. Since the Galaxy S5 was announced in February, and released in April, we assume the Galaxy S6 will be introduced at about the same time next year. Well, we can hardly wait to see what Samsung has in store for us! Make sure to stick around for further leaked details, as there will definitely be more to come in the near future. I would prefer 5 ou 5,2 in a compact and design body. Thin metal bezels of course. +1 absolutely !! I would also like to see S6 with 5.2-5.3" screen in a compact body !! why so the year after that you can say I would like 5.5? Technically as i know, 5433 is same with 7420 with 64bit enabled. From the 2nd last para, it's not really the same thing:-http://www.anandtech.com/show/8537/samsungs-exynos-5433-is-an-a57a53-arm-soc "While the Exynos 5433 seems nothing more than a "brain-transplant" in terms of SoC design, the newer Exynos 7 chip is a genuinely new part. Over the last 3 weeks Samsung has been busy submitting patches to the Linux kernel mailing lists adding support for their new SoC lineup. The Exynos 7420 seems to be on track for Samsung's next flagship lineup, this time in full 64-bit AArch64 mode with Android L. The details of the chip are still sparse, but we'll be seeing the same A57/A53 CPU combination together with an Mali T760, powered by an LPDDR4-capable memory controller." Whichever the case Samsung has no other better window for its aarch64 push with S6. That being said lol as I'm becoming more and more less emphatic towards flagship models or SoCs, hard to really get excited about this 7420 as long as Samsung maintain their non-open Exynos policy. Your Note 4's 7 Octa/5433 (same thing just renamed) shall be the acid test when they get their next L/5.0/LRX21x build out. because if they don't, everyone will be saying its just a lame upgrade, that's why. That shouldn't be surprising. The Note 3 and S5 have very similar specs. Mate cheap Chinese brands can't compete with Samsung, LG, HTC and Apple. Even those Chinese brands offer a phone for say $50, I still won't buy it. So keep your crap with you mate and troll somewhere else. They are already competing. Ever thought of Xiaomi beating LG,HTC in sales? Now next target is Apple and Samsung. 5 years before there were no chinese brands in top 10. Now half of the top 10 is chinese. See Xiaomi, Huawei, Lenovo(+Motorola) are 3 among the top 5. Even Motorola is Chinese now. And there are OnePlus, Meizu, OPPO, Gionee etc. soon to enter top 10 in sometime. How can you discount the Chinese so easily?? Be logical not emotional! 'cept that it's 10x easier to buy Xioami, Huawei, ZTE and Lenovo than 1+ you should've mentioned that as well in this context. Beauty of Android: Unlike Apple, Samsung HAS TO compete against the cheap Chinese ones. I like Samsung phones but its true the Chinese brands are killing Samsung (and others) in China in terms of valume sales. They're making headway in other large asian markets as well. Eventually they'll probably try to make their way into western markets but they'll likely face a lot hurdles since they'll be open to patent suits from Samsung and Apple. Either way it means more competition and better prices/features for the consumer. 2k screen, 64bit chip, 20mp main camera is 90% similar to One plus ? Well this one gets released in april, oneplus some time i 3rd quarter. And it Will not have amoled screen, OIS Camera etc.... Oneplus phones are just Off the shelve standard components, at cheap china prices, there is notering speciel about it. So I for one defo Will buy the samsung over the oneplus ANY DAY. Whatever Oneplus one is good .. I will buy Samsung or Sony or HTC or LG.. I don't like Chinese Product! And what was the AnTuTu score? What about OIS and IP57 ???? Specs wise Sammy is always ahead, the only thing is design if it's great then it'll be a killer. Most of times we will not know the quality of components, eg, speaker, reception of WiFi, screen response. I believe iPhones have better screen response than the Note and Galaxy S I own. It coyld have a spectacular specs with lower quality components. Thats why some phones sound better than another. Sammy's overall quality is much better than the competition. 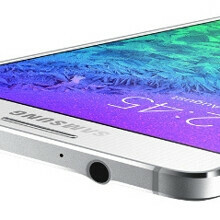 If the s6 has a 5.5 inch screen they'd be in the territory of cannibalizing sales for the Note series. It's probably fake or one of the other million galaxies out there.